The Earned Income Tax Credit (EIC) is an anti-poverty measure in the tax code that provides a refundable tax credit to low income working Americans. While it has its roots in the 1970s, I am old enough to remember that EIC was largely expanded in the tax reform measures of 1986. President Reagan called the EIC , "the best antipoverty, the best pro-family, the best job creation measure to come out of Congress." Like any law the EIC is imperfect, of course, and I find some of the unintended consequences of the EIC to be quite troubling. First among them is that some tax preparation firms take advantage of the EIC to line their own pockets. In a nutshell, EIC made it profitable to serve low income clients. Far too many people with simple income tax returns became willing to swallow a $400 tax preparation fee when informed they can get a $5,000 refund. The prospect of having some extra money is exciting, and the hefty fee gets lost in the excitement. After the EIC was enacted tax prep firms started springing up in low income neighborhoods all over America. When I was in the Navy it was well-known that near any Navy base you could find plenty of bars, pawn shops, and payday lenders. Thanks to the EIC you can add tax preparation firms to that list. There are at least 10 within a mile of the main gate for JEB Little Creek-Fort Story. It's not that I think low income people shouldn't have access to professional tax preparation. I just object to the outrageous fees most places charge to do an EIC return - a fee they can only charge because the return will generate a large refund, giving the low income taxpayer a means to pay for the tax preparation. The tax credit is supposed to help Americans out of poverty, not enrich the corporate tax mills. A second problem with EIC is that it's paid as a lump sum. I am a professional financial planner, but if you handed me 4 or 5 months' worth of salary all at once I'd be hard pressed to put it to use in an entirely efficient manner. Lump sums are just flat hard to deal with for anyone, let alone someone who may not have the financial knowledge to use it effectively. If the person receiving it doesn't have good money management skills the EIC might be good money thrown after bad. We want EIC to help lift people permanently out of poverty, not just give them a brief respite from it. And finally, there's fraud. Billions of dollars in fraud. There are some taxpayers (and tax preparers) who are willing to lie to get EIC. It's frustrating. The IRS has put additional measures in place to try to stop it, and it still happens. To a degree it is to be expected, but we should never accept it. Nor do I think we should throw the baby out with the bath water. Some people abusing the rights and privileges of a prosperous society shouldn't be the reason we start withholding rights and privileges from everyone else. I am a firm believer that every taxpayer should claim every credit and deduction they are entitled to. If you meet the requirements for EIC, I'll help you claim it. I don't try to enrich myself on EIC returns at PIM Tax Services. I charge a bit extra because there is an additional "due diligence" form the IRS requires me to complete. The form is a fraud prevention measure, and I take it seriously. In addition to being a tax preparer I am also a financial planner, so I can offer clients some ideas on how to make the most efficient use of large tax refunds. There are some problems with the EIC, but it's nothing we can't handle face-to-face in my office at tax time. The process of withholding tax preparation fees from the refund is called a Refund Anticipation Check or RAC. They are a convenient way for many people to pay for their tax preparation service. Despite that, I don't offer them at PIM Tax Services. The primary reason is that I can't do it without charging a fee of $25 to $35 dollars for it. RACs get processed through a bank, and the bank charges for that service. Ordinarily (no RAC) the IRS will send your refund directly to your bank via direct deposit. There are no fees involved in this transaction. 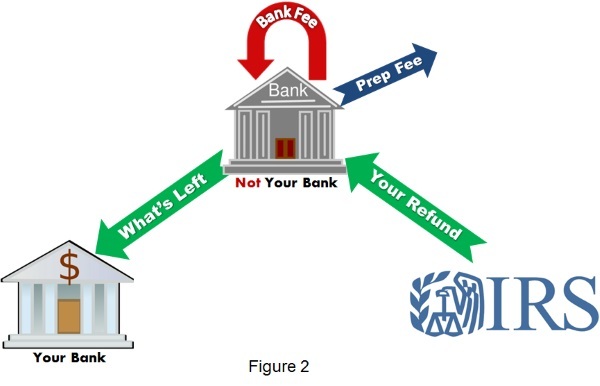 With a RAC the IRS sends your refund to another bank. That bank sends the fees to the tax preparer, takes their own processing fee, and then sends what's left of your refund to your bank. The IRS will only send your money to your bank account. In order for the IRS to send the money to the RAC bank you must open an account at that bank. If you've had a RAC in the past, that's what all of that paperwork you signed was for. You opened a bank account at another bank and told the IRS to send your refund there. That bank received your refund, took out the fees and then forwarded the remainder to your regular bank. It added a few days to the time it takes to get your refund and cost you some extra money - neither of which is very efficient. The second reason I don't like RACs is because very little is known about that middle-man bank. Several years ago the IRS stopped letting tax preparers and banks know in advance whether there was a tax lien against a taxpayer's refund. (Tax liens are typically issued if there are back taxes or child support owed, or if federal student loans are in default.) If there is a tax lien then the IRS doesn't send the refund to the taxpayer, they send it to the creditor the taxpayer owes money to. If that happens to a RAC transaction neither the bank nor the tax preparer get paid because the money never comes from the IRS. This policy change by the IRS ran the most reputable banks out of the RAC business. The banks remaining in the RAC business increased their fees (to compensate for their increased risk) and kept marching on. What do we know about those banks that offer RACs? Typically very little. If you've had a RAC in the past do you even know the bank's name? (You have an account there!) They are real banks, regulated in the USA, so we could find out about them if we are willing to do some research. (Who has time for research?) Do they have good cyber security in place? You have to send them a lot of information to open a bank account. How are they taking care of it? Do they sell your e-mail address and phone number to marketing firms? There are too many unanswered questions for my taste. I am not opposed to convenience. If I can find a way to process RACs for free (or nearly free) using a bank I know and trust I'll start offering them. Until then, I prefer to do business like most places in America and take care of the fees at the point of service. Cash, check, credit, or debit - quick, easy, and secure.